The singularity was here – did you miss it? By many measures, technology advances exponentially. If you plot out a graph what you see is a very long tail hovering just above the x axis. Next comes a sharp curve up after which the line goes vertical. If the x axis represents time, the singularity is the point at which the line goes vertical. The next day, everything is different. One of the interesting things about the singularity is that it is a rather opaque barrier. We simply cannot imagine what lay on the other side because nothing before the singularity prepares us to imagine, let alone comprehend, the possibility space which lies to the right of the line. What most discussions of the singularity omit is that despite knowledge going vertical, our exploitation of that knowledge takes a little longer. Back when encyclopedias were printed volumes that took up 10 feet of shelf space, the acquisition of one may have exponentially increased the volume of data available to you but you then had to read, process and understand it before you got smarter. So if the singularity happened today, tomorrow would not be all that much different. We’d still have to assimilate, process and exploit that technology before it could transform people’s lives. So how do you know when the singularity happens? How do you know it hasn’t already occurred? To me the answer to this question lies in the opacity of the event. Just as it is difficult to imagine life after the singularity, people living in the post-singular world will have difficulty in comprehending or imagining life before the event. Based on this, I have concluded that the singularity (well, one of them anyway) has already occurred. I can’t pin down the exact date but it definitely happened sometime between November 1984 and today. How do I know this? Because in November of 1984 Creative Computing issued their 10th anniversary edition and I still have my copy. Let me show you the evidence. 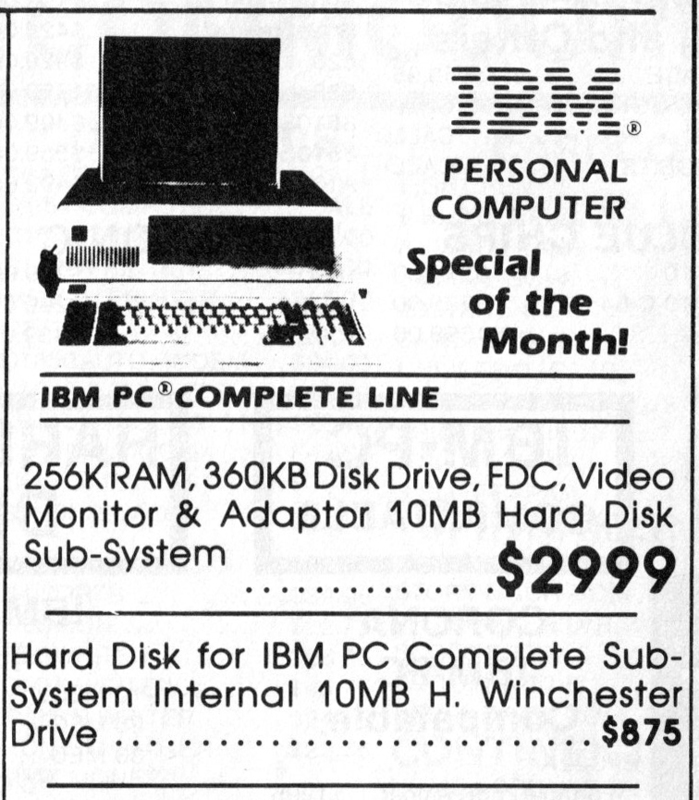 this and an Arduino buuuuuttt…..
Here’s a cutting-edge PC from 1984. Remember when we measured memory in K? Remember when hard drives were measured in megabytes and 10 MB cost $875? Remember when the disk controller and video adapter were optional? Remember when $3,000 was the price point for a PC you’d actually want to use? If you didn’t live through this period in history, this probably looks very weird to you. In fact, it is hard to imagine people doing anything serious on a machine with these limitations. But that’s the opacity of the singularity – at the time, these were not limitations. This was a VERY capable machine on which you could run games or serious business applications. Here’s another example. The interesting thing to me is not so much what’s on the page but the fact that they used a green-bar tractor-feed paper theme. It is that theme and not the prices or the items being sold that dates this ad more than anything else. Again, at that time, this lent the ad a cachet of hi-tech. You weren’t a computer geek unless you had something on green-bar paper. Code listings, reports, printed copies of the COBOL or Assembler manual, something. Today of course you can tell the ad is an antique based on the look, assuming of course that you even recognize what it is. Again, looking back through the singularity it is hard to imagine that somebody actually got paid to think up using a green-bar theme for the ad. Some account rep was at work one day when a copy editor burst into the office screaming “I’VE GOT IT! We can print the ad in color and make it look like green-bar paper!” Pre-singularity that idea gets you a bonus. Post-singularity it gets you fired. Why bother with all that pesky typing? But so far my evidence is all price points and technology – things we expect to have changed and just take in stride. K is now GB? Meh. “What,” you may ask “do we actually DO differently today than in 1984?” Well, I’m glad you asked. Witness the program listing typing service. Today of course the magazines don’t put full listings in the pages because those are darned expensive to print and mail out! Code snippets, sure. But the actual full source code listing is a click away on the web site, along with the compiled executable of course. Back in 1984, not so much. 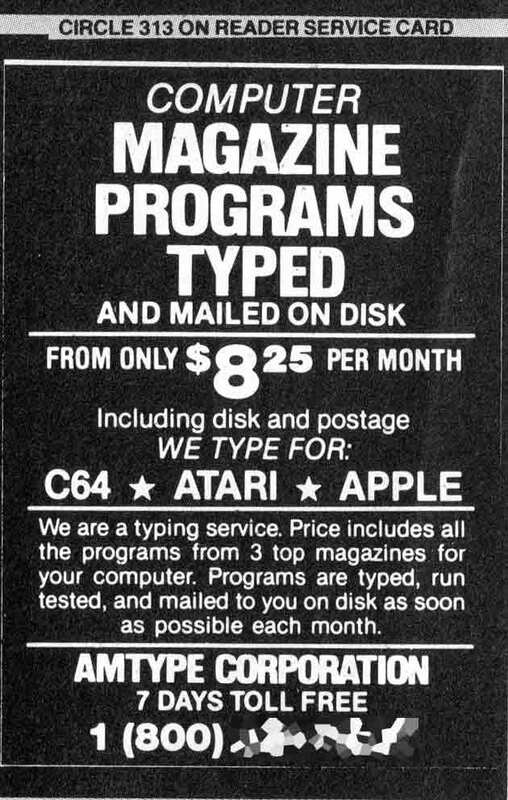 No, back in 1984 somebody keyed the programs from the magazine into a computer of the type they were intended to run on, proofread the listings and then ran the programs to make sure they were typed correctly. Once this was completed, they copied the source listings to diskettes and mailed them to you using the US Postal Service. If you were really lucky you would get the program files delivered within three weeks or so after the magazine arrived. The limiting factor for the business operating this service wasn’t the $8.25 they charged you but rather that many people didn’t want to wait weeks to get the source code and instead keyed the listings in on their own. Of course, this notable absence of Internet communication shows up in other ways as well. See that “reader service card” reference at the top? Back in the day, rather than contacting each advertiser directly, you filled in your name and address on the reader service card and then circled the advertisers in whom you had an interest. On receiving the card, the fulfillment service either forwarded your contact info to the advertiser or ran your pick-list in house and returned the advertising materials via US Postal Service. From this side of the singularity such practices seem closer to stone age cave paintings than to QR codes. IBM wisely chose to adopt Apple’s model of an open PC architecture. But wait, there’s more! Before the singularity, Apple was an open architecture. Yes, you read that right. At the time one of the design goals of Apple was specifically that you could, nay were expected, to tinker around under the hood. 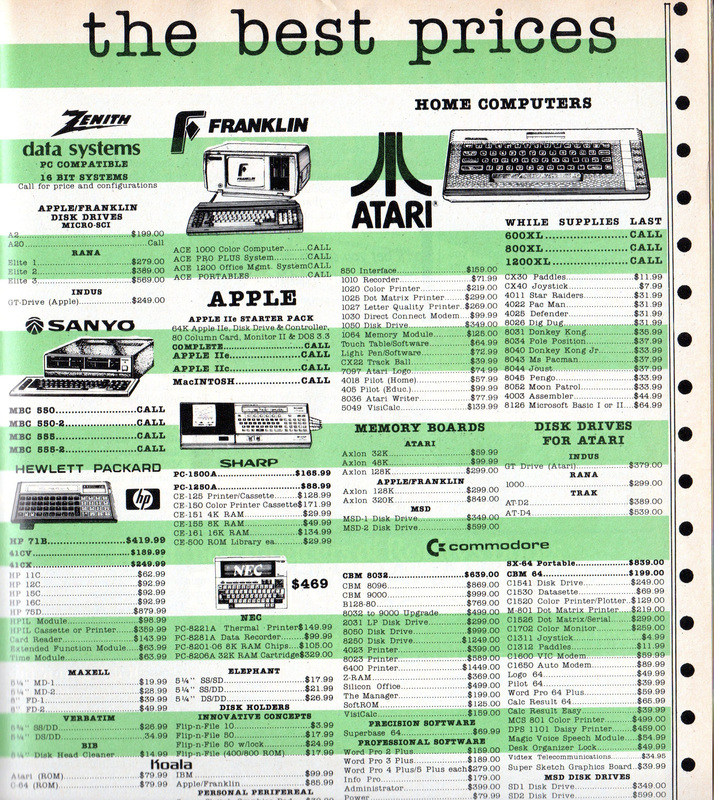 In testament to this, the advertising throughout the magazine is chock full of 3rd party add-ons such as modems, memory, video boards, disk drives and even a graphics pad and pen. The openness of the platform was an intentional design feature and one which, according to the IBM feature profile in the magazine, was adopted for the IBM PC. If you didn’t live through this era, it is hard to look back through the singularity and imagine a time when Apple set the standard for openness. That’s okay though because people on that side of the singularity would have laughed in your face if you had suggested that Apple would one day lock down its platform and jealously defend it in court against any who would try to run their own operating system on it or use any hardware or software interfaces that were not publicly documented. If you happen to invent time travel and go back to 1984, I would suggest you keep that bit of info to yourself while visiting the local Apple user group or risk life-threatening injury. In the bizzaro world, Superman is evil and skinny people are running rampant. Finally, I have one more piece of evidence to share. One that, more than anything else, illustrates how the pre- and post-singularity worlds might as well be parallel universes. If you lived in one and visited the other, things would appear mostly normal, but something udefinable would be eerily wrong. If nothing else here convinces you that we’ve already lived through the singularity, this surely will. The magazine was divided into several themed sections covering past, present and future of computing. The “Philosophy/How it ought to be” section, Ken Williams discussed the economics of software publishing. Ken was not yet 30 and founder of five companies, including Sierra Online which was at the time the largest independent publisher of home computer software. In his article, Ken mentions an example of a software project that was eventually abandoned due to there being no market for it. And that, my friends, should be ample proof that we’ve lived through the singularity already. In the universe you and I inhabit, nobody has ever complained about there being too many skinny people in America. Got any other evidence of the singularity? Happen to know exactly when it occurred? Let me know in the comments. This entry was posted in Tech and tagged future, history, ray kurzweil, singularity, technology, technology advances. Bookmark the permalink. 3 Responses to The singularity was here – did you miss it? I met my wife Lisa through a personal ad in a newspaper… however, rather than explain that whole dating process back then (newspapers, personal ads with voice mail boxes etc.) I usually tell people we met on match.com (in 1995!) and nobody questions it!